The last day of school. Woo-hoo! We did it! Accomplishments of this week include, getting to three awards ceremonies and not missing anything, getting refreshments, money, supplies and whatnot to three classrooms and scrounging for school lunches this morning in an empty pantry! It's causing me to ponder a few things here lately. Mainly, they're all gonna be at home! With all the stuff that's been clogging their school desks all year. Mucho stuff. No more loud, frantic whispers in the mornings as we "try not to wake the baby." No more changing clothes a hundred times a morning because, for the most part, basketball shorts are accepted summer apparel. No more staying up until midnight hunting for Anne Frank costumes, inventing stuff or drilling spelling words and logging reading minutes. Just lazy days, swimming pools, movie nights and the search for an easy routine. Camps, camps, camps. Soccer, baseball, basketball and VBS. Grandparents. Need I say more? We have survived. Kindergarten graduation, citizenship awards and next-grade promotions. Goodbyes. Lots of goodbyes. Goodbyes to teachers, goodbyes to buildings, goodbyes to friends. Our current school is being demolished over the summer and our brand new school will open in August. Super exciting! Our good friends, Katelyn and Timmy (and their mom Jessica) are moving cross country. Their dad serves our country in the military. We are very, very sad they have to go. It's been a lesson to teach the children that there are many sacrifices made to preserve our country's freedom. And this is one they can see and feel. Please pray for our friends as they start over another time. It's something they are familiar with but it still hurts to see them go. Did I mention how sad we are? So with all that said, I guess I'll go make some room for their stuff and plan something fun for this afternoon. Yippy! In two days summer will officially be here. Camps are starting. Pools are opening. Excitement is in the air. I am excited. The children are excited. We love summer. I feel the pressure. Two days to find the rhythm of summer. I don't function well without rhythm. Mine is unique and a little fast. More rapid and with less repetition and very little rests than most but one that I love. One that I will miss dearly if I don't find it in time. 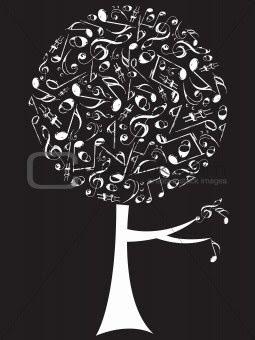 Two days to find the rhythm that sings a melody with some parts of harmony instead of a ruckus that hurts my ears. And my head. And, in turn, unfortunately, my heart. Two days to take a handful of notes resembling a cacaphony and produce a symphony that when coupled with our life story will write a beautiful score. Thankfully, I know just the Composer for this job. I want us to dance through this summer without tripping on each other's feet. This summer is sure to be exciting, fun and well, over before we know it. That's why I'm praying for rhythm this week. Not as in here, here. But as in bloggy world here. And don't miss out on this opportunity to meet one truly amazing college student. Meet her. Share your comment love with her. Because if you don't, you'll totally be missing out; she's one pretty awesome college girl. Really, who knew they could be so devoted to God and his purposes? Who knew they could be so willing to give up their t.i.m.e.? And, while you're at it, pray for me too. Baby Boy is sick. Throw up and a fever. Sheesh! Last night our family went out to dinner. A small thunder shower erupted while we were eating. As we opened the door to leave the restaurant a refreshing cool breeze greeted us. As we were driving home, Andrew spotted a rainbow. Rapidly scanning the sky I spotted its dim hues. Now trying to direct four children to catch a glimpse of a dimly disappearing rainbow can be quite a task. Especially amid all their chatter. As soon as I could, I pulled to a stop and directed all their eyes out the back window. Julia was first to spot the small bow. Alyssa quickly followed then patiently directed Hunter's eyes until he was able to briefly see its magic. Palmer could not turn his head because of the restraint of his car seat. As soon as we pulled into the garage, we all jumped out of the car to see if the rainbow was visible from our drive. The sight waiting for me was a treat to the eyes! A huge, brilliant, vibrant every-color-of-the-spectrum-visible-rainbow greeted us. The lesson of the rainbow's awesomeness was not lost on me. What could barely be made out in the moving, crowded car filled with distractions was unmistakably larger-than-life as we all stood silent and still taking in its wonder. Alyssa and Palmer took off running down the driveway. As thunder cracked I beckoned them to the safety of the garage. Hand-in-hand they came skipping back as Alyssa lovingly exclaimed, "I took Palmer to see the rainbow...And he can see it!!!" As the lightning began to flash and the rain began to fall, one by one the children and Andrew all fled to the house. When one particularly long roll of thunder sounded, very loudly, I ran out into the rain to grab Palmer. I paused slightly to imprint on my heart his expression of delight and wonder at the discovery of his first rainbow. Just before I scooped him up and whisked him away, my three-year-old boy-wonder stood with his chubby, little finger pointed high above and exclaimed, "Mommy, did God make that rainbow?" Through my tears, I hugged him tightly and whispered, "Yes, son, He did." Mommy, Did God make that rainbow? Have you ever heard someone say that their old books are like good friends? Last night I discovered that my old friends are like good books. I met with some friends that I haven't gotten to visit with in a loooong time. I drove to an old friend's new house and curled up on the couch like I'd been there a million times. I was brain dead, an hour late and preoccupied because my children weren't all in bed yet. And it was well past bedtime. My friends didn't mind. They were just happy to see me, hug me and let me listen to their rambling. When I'm curled up on my own couch with a good book I've laid down during a busy season and have just picked up again, I'm re-immersed after just a few sentences. It only takes one descriptive word to capture me and drag me right back into the plot's center. That's how it is with old friends. When life gets crazy you just add a comma. Last night's chatter began with a lower case letter. Our weekend was fun. It was great to get away. Sometimes you just have to. Rejuvenate. Reconnect. Remind. Refocus. Relax. We ate good, really good, food. We walked long, really long distances. We saw awesome, really awesome animals. We got wet, really wet in the flash flooding! I do believe that it takes rain to make things grow. I also believe that until one has experienced rainy days, a full appreciation for the sunny ones cannot be felt. We need both to grow and bloom in fullness. We made the most of the rain by sprinting through it to our car. Some of our children sprinted. Some were left splashing in the pouring, freezing rain. We went in search for the perfect thing to save the day. We found it at an exciting place to eat. The Magic Time Machine. I haven't been there in thirty years! Indiana Jones was our server. The children giggled with delight the whole time. I decided the rain wasn't so bad after all because it gave me a much needed nap. A little R&R for the trip was medicine for this tired mommy! As soon as the rain lifted we toured every museum and oddball attraction across from the Alamo. We saw Ripley's museum, Guinness' museum and the wax museum. Watching the children's different personalities in this crazy atmosphere was hilarious and inspiring. The way they all behaved and interacted was heartwarming, reminding me once again of the great blessing of a large family. We ate dinner on the riverwalk and fed the ducks our chips. Sunday morning we got up early and raced back to the zoo to finish what we started on Saturday. It was nice and cool and all, I mean all, the animals were playing and friendly. The hippos swam for us and our favorite attraction was the monkey that kept escaping from his cage. We saw a zoo break! Who thought there was no way Madagascar could happen?!? These are all the little monkeys I took home with me. I think some people really think we live in a zoo but aren't they cute? Exactly eighteen months from today, I will turn forty. About eighteen months ago, God started talking to me about destiny. I think I finally heard something he's been trying to say to me for a long time. For lots of years I thought that if all I had to show for my adult years was a lasting marriage and four wonderful children, that would be fine. Afterall, that's all I really want. When the Lord started speaking to me, he showed me just how fast they would all turn eighteen and move away from my home to make homes of their own. I want that for them. That's very healthy. Very good. I love them. I love caring for them. I can't imagine a life where I don't meet all their needs and wear them as accessories. I just don't want to be lost when that happens. I could see myself getting lost. I felt hopelessly lost for the first few years of marriage. I loved Andrew madly. My heart's desire was to help him, encourage him and honor him. I just didn't know how all that fit into the life I brought to our marriage. It was a very difficult transition. I think I stayed a little lost while I was birthing at least two of these many small children I have. I decided on that day God talked to me about my destiny that I would not spend another year regretting that something did or did not happen. I would quit using the phrase, "One day..." so much. I began to get serious about writing. Praying for opportunities to speak. Believing that God would somehow find a way to use me. Ordinary me. Longing to be used by an extraordinary God. Amazing. This spring I started getting speaking engagements. Those dreams are becoming reality. That part of life is very excited to see forty. The speaker/writer in me is ready to move forward. Another goal I have but had put to the side because, "I really don't have the time for it," is getting in shape. I'm not gonna lie here. I want to look great. I want to be in awesome shape. I want people to gasp in shock when they hear I'm forty. Shallow I know but it's the truth. I don't just want to look great either. I want to care for this body. I want to eat healthy foods, exercise regularly and have stamina to keep up with my life. I want to play with my grandchildren and great-grandchildren and live to be at least 100. My dream is to see at least three generations praising the Lord with their lives. With all those goals in mind, I began running a few weeks ago. It just took me about two weeks and my desire to return to the gym was back. I'm already a little stronger and don't want to miss my workout. I am praising God for that! All that said, for my fortieth birthday I don't want to just go out to dinner and indulge in a big piece of chocolate cake. Nor do I want to have an eighties party with five friends. I want to do something I would never, ever do for any other reason. I want to do something huge to prove to myself that forty is not too late. That it's not the beginning of the end. I want to prove to myself that I can accomplish anything I put my mind to in the years to come. So, in 2010 I'm running a marathon in Chicago! Yes, me. Me and my love/hate relationship with running. Seriously. Right now I can run three miles. A very small start. Actually, I'm not even sure how long a marathon is. I think I need to add about twenty miles or so to my route. But that's okay. I'll figure it out and keep pushing for the goal. This is where I need you, bloggy friends. I will desperately need your encouragement because I can't do this on my own. I don't want to stop. I don't want to fall short. I need a good training program. Because you're smart, I'm betting you have some advice for me along with your encouragement. This is just my announcement to the world that Forty is coming after me and I'm not going down easy. It's going to be better than thirty, better than twenty and the start of the best years of my life! 1. Alyssa finished softball. Yaaay for a strong finish! 2. Without God we would have one week, I mean weak: Sinday, Mournday, Tearsday, Wasteday, Thirstday, Fightday & Shatterday. 3. We are going to the zoo today. This literal zoo not the figurative zoo I live in. 4. Monday is a very special day. I'll tell you why on...Monday, of course. 5. I love summer and this weekend reminds me of summer! Laundry. Mopping the floor. Fitness. Raising children. A balanced life. I've found these things to be false peaks. No matter how much laundry I do, I still have another load to wash. Because just as sure I'm washing, folding and putting it all away those in my household, including me, are wearing clothes. Thus, soiling them. The same is true with a freshly mopped floor or a bathroom. As many household chores as I accomplish or as quickly as I do them is of little concern because when you have to go, you have to go. Thus, soiling the potty! Just as walking soils the floor. Every day we make our beds. Every night we unmake them to sleep. Doing and re-doing everywhere with no end in sight. My friends, life is a circle and I have been searching for its summit. Just as I've been struggling to "get caught up" with laundry, organizing the house and to return to a regular exercise routine, I've been struggling to find balance in my hectic life. Work, play fun, devotion. How can we live, love and laugh while meeting our responsibilities? Since returning to the workforce part-time at Andrew's office two years ago, I've led, what seems to me, a mostly unbalanced life. For far too long I've blamed this on our need for me to be at his office and available to clients. "If I were only able to be home more..." has become the refrain in my train of thinking. Ummmm, not proud to admit that. Trying desperately to change that. Step by step. Hence, the running. Running has taught me that the steadiness, as well as the ups and downs of life, are changing me. Helping me to live better. Giving me deep joy, gratitude and endurance. Disciplining my character to become that of Christ's. Even reminding me that a Christlike attitude is not something gained, achieved or presented as a trophy. It's something to be worn, picked up and put on daily, a constant choosing that will not always prevail. What is gained is ease in choosing to exercise it. Each time I humble myself makes the next time come a little sooner and the choice-making process a little easier. My hope is that I will learn to wear this attitude as a medal. Choosing to place it around my neck being ever aware of its weight so it will be a constant reminder to choose knowing it will not be fully acquired this side of heaven. Shucks! I want to "arrive" in this lifetime so badly. Knowing that I have the power to be fully mature because I possess the Holy Spirit yet, failing is frustrating at best. Humbly I am reminded of the grace that chased me and thankfully caught up! When I forget or lose sight of that, I proudly think I have peaked and most certainly fall down again. Take fitness for example. Here I am an almost-forty-pushing-a-weight-range-that-is-not-welcome-in-this-body ex-aerobics instructor. Seriously. Wake-up call. I was the one who would not ever be physically weak or gasping for breath as I played soccer with my children. These legs who have not seen shorts in over three years were the legs that were gonna last. I was a runner. I was an avid gym goer. I love to exercise. I love to work up a good sweat. Then all of a sudden, life snuck up on me. I started working, shuttle children to after school activities and I did not have time to complete my regular gym routine. I could not continue teaching aerobics because baby number four put some constraints on childcare. Then it happened. Wham! I was out of shape. In a matter of two years I went from being in the best shape of my life to the worst. 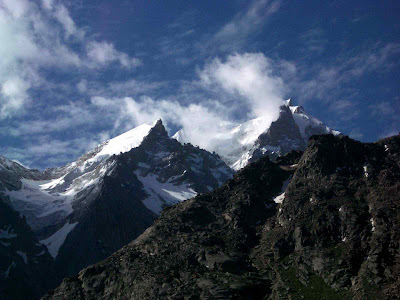 False peak. Prior fitness is of no use to me today. I realized yesterday that I have this same tendency to think I have a destination to be found. When God has me walking in my calling, I'll be fulfilled. When God does X, I'll feel I've found my purpose. What lousiness that line of thinking has produced in my heart thus far! I now realize that my purpose, my calling, my fulfillment is a destination. I think I'll go fold some laundry. Tonight we finished yet another sporting season. Hunter finished his tee ball season strong tonight. He played catcher and first base making some great catches and outs. He really likes baseball and keeps asking me if he has one more game left. "There are many seasons yet to come," I keep telling him. Hammerin' Hunter Smith as his coach called him is very proud of his trophy! We are proud of him! A long, long time ago in a post faraway Beth from Not a Bow in Sight gave me this award. Sweet Beth who not only is a mommy who loves Jesus and all her boys, she's also an Aggie (One who attended Texas A&M University...for all who wonder)! I was so happy to meet her and know it's only a matter of time before I get to meet her in real life. So she blessed me with an award. It was a happy day at glad chatter as it was my first award. Not quite sure what to do with it, I didn't do anything. I think I am supposed to pass it on to a certain number of people but since I feel like I have many sisters here in bloggy land, sisters, you just grab it if you want it! Free from me. 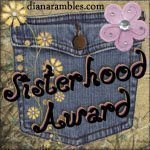 Sisterhood award. A fitting story here would be the story about Sandy at God Speaks. We left comments on one another's blogs at separate times not knowing the other left the comment that said something like, "Wow! I think you wrote that about me. I could've written that." We have determined that we are, in fact, sisters separated at birth. Just waiting for the day we get to meet. Seriously, we think alike. Exactly. So today, celebrate sisterhood and go visit Beth and Sandy. Tell them I sent ya! I wanted to sit down and write but try as I might words did not come. Instead I thought of all the places I must go at morning's light, how few hours of sleep I'll get, the craziness it will take to get lots of children to many different places all at the same time, how we don't have enough time to do homework tomorrow night and how the baby will once again go without a nap into a very late and long night. That's what is in my mind. Since I lacked my own words of wisdom, I turned where I so often do for a word of wisdom. I found this. "when my heart is overwhelmed, lead me to the towering rock of safety...Then I will sing praises to your name forever as I fulfill my vows each day." Psalm 61 expresses my internal ruckus so very well. My prayer is that as I live this crazy chaos that is my life I will sing praises to His name remembering all the blessings that brought the many, many responsibilities. Last week was pretty crazy. I was really tired. I got a little discouraged. I took my eyes off what was eternal and started to look at my circumstances. They can be rather overwhelming at times. Though this life is temporary, and that includes my present place in life, it can seem endless at times. I called a friend and asked for prayer. She listened. She prayed. She texted me this, "Your purpose isn't in where you end up, but in how you live on the road to the destination." Just seeing those words. Written. In black and white. Spoken. From a friend. At just the right time. Made me weep. I got up, brushed myself off and continued walking. It seems I want all the answers before I even ask a single question. I want to know what the end is like before I've seen the beginning. I want the whole picture before I start drawing on the canvas. Accepting that I will only know in part until I reach heaven is crazy-hard. If I lose sight of this journey's true destination I'm destined for disappointment. Every.single.time. I'm not very good at waiting. I'm even less good at committing to something I don't fully know or yet understand. I'm becoming more good at this. I'm spending less time in the question-asking place with God and more time in the accepting-what-I-do-not-understand place. The things that I so deeply desire and am obviously still waiting for...do not hold the paralyzing power over me they once did. Looking toward the One guiding me on this journey removes the fear that once held me captive. Looking toward my destination helps me walk. Looking toward Him helps move me forward. My destiny is beholding Him. Happy Mother's Day...there's still a few minutes left for all my motherly bloggy friends. My weekend was wonderful. We spent Saturday at the soccer field. The tournament was awesome. Julia played so hard. She is really a fierce competitor. Three games in scorching Texas heat and humidity. Bruises, scrapes and sore muscles are her companions today. Sunburn, tiredness and allergies are ours. We were really the underdogs. We had a shot at getting to the big final but it would take lots of fighting to make it. We tied our first game and had to win our second game 3-0 to play the final. The girls pulled it off winning 4-0. The final went into overtime and we ended up losing 2-1. I ended up losing my voice yelling for my girl! Truly, no place else I'd rather been. She's so good. It's a joy to watch her play. She had a blast and is sad soccer season is over already! Sorry Coach, didn't mean to cut off your head, I promise...it was dark and late and we were tired. Sunday morning brought me breakfast in bed. Julia got up early and worked quietly to surprise me. She had all the details planned and my oatmeal was cooked perfectly! We had lunch at our local lake and the weather was perfect. Everyone cleaned for one hour giving me an hour of their time so we could start our week with a straight house. I was very blessed by that! We saw the movie Earth. Alyssa loved it! She knew all the animals and was busy spouting off animal trivia to me the entire time. Palmer pointed and squealed when we he wasn't asking for candy, popcorn or coke and he went to the bathroom twice and ended up having to leave early. Julia watched half and fidgeted for the other half. Hunter slept through the whole movie and that's the Smith family review. Grocery shopping, homework, a beautiful bouquet of roses and a steak dinner by chef Andrew rounded out my day. I've had to be rather absent from bloggy world lately. Here's a taste of our weeks for the last couple of months. This week holds five games, two parties, three end of the year picnics, a visit from grandparents, a Mother's Day tea and the other regular stuff. I just wanted ya'll to know I've missed you. I've missed stopping by and chatting. If you haven't heard from me in awhile just hang on, life will slow in another week or so. For now, I'll practice the wisdom found in all moms favorite Proverb. "She gets up while it is still dark...and her lamp does not go out at night." Because life is a little crazy for the moment. My boy and his boots are tired, very tired...and very, very cute! Meet Elizabeth. Or Lizbah as Palmer calls her. She is our Aggie. There are lots here in our town but she is ours. She is my young college maiden, offering to serve me and share her heart with me as we keep our arms busy. The purpose of our friendship is mentoring, the sharing of life experiences together. I have lots of life experiences to share, lots of things I wish I'd done better to share and lots of laundry to share. This semester Elizabeth has been a huge blessing to me. She comes. She cleans. She helps with homework. She shuttles kids. She loves the children. She loves me. She absolutely loves Jesus. And she folds laundry. Lots of laundry. Next week Elizabeth is leaving for the summer. So sad for us. But she is coming back. Coming back in the fall are some of my favorite words to say in the same sentence as Aggie. Because lots of times Aggies don't come back in the fall. sniff. sniff. Lizbah's coming back and we will be ready! Would you join me in praying a blessing over her serving hands and loving heart as she ministers to her own family this summer? Pray that she finishes finals well, serves her family in love and finds maidens of her own to mentor. In honor of the National Day of Prayer, I want to introduce you to a new bloggy friend. Lisa is a woman who love Jesus, prays fiercely and encourages freely. When I began to prepare my heart to lift our nation up today, I thought of Lisa and her faithfulness in prayer. She is truly one who calls warriors together, leading an entire army to storm the throne room and defeat the enemy. So visit her, encourage her and pray lifting our Savior's name while you're there. Father, I thank you for being King today. King of heavens King of earth. I thank you for the privilege of living here in America where we are free to worship You, free to study Your word and free to speak Your name. Today I lift our nation, our leaders, our government to you. Lord, I thank you that you are greater, mightier, bigger than America. I thank you that you are a God who forgives sin and changes men's hearts when we humble ourselves before you. Lord, have mercy on our nation. Forgive our pride, our arrogance, our indulgence, our greed. Make us into a nation that fears you. I pray for the church in America. Lord, make us into one that shares our resources, cares for the poor, believes in miracles and lives the Word of God. Jesus, give us boldness to declare your name and deeds to all men. Really, this has been a successful softball week. Julia had a great hit last night and walked to score tonight. Last game Monday! By the way, her soccer season has been amazing. She found her groove a few weeks ago and has quickly and unanimously become the most improved player of the season. Her coach told her that her attitude had been so great she could pick her position. She did an awesome job playing midfield and defender. This has been a great season for her and for her team. The tournament is Saturday. Last year they went to the championship game and can do it again if they utilize teamwork! Alyssa had a great night tonight too. She got to play catcher. Finally! After weeks of asking the coach, he let her catch tonight. She was so happy. I was so relieved. She has asked where he barely heard her and then tonight she caught him before the game, looked him in the eye and politely asked if he'd let her catch. He said yes. Catching filled her with so much confidence, she hit a single right to the shortstop, made it to second on an error (Can that be a double since she's only seven?) and scored one for her team. When games ended around 9:00, we headed out to celebrate Cinco de Mayo with Mexican food for dinner. In my defense, it was too late to cook. Happy Cinco de Mayo, ya'll! We've had a busy couple of weeks. Nice. Different. Busy. I learned of many antics my children participated in throughout the semester. Some initiating, some following and lots of opportunity for learning took place. I've spent the last two weeks punishing for past offenses and trying to impart life lessons. I want my children to be effective leaders, submissive followers and Godly influencers. Whether they are iniating, participating, discipling or playing I want them to know they represent Christ and to feel the weight of that responsibility. Trying to teach them a now heavy burden will eventually become a light and very welcome yoke when Jesus steals their whole heart is not only humbling, it's impossible. We had one such discussion yesterday. Both children involved took their consequences humbly and repentitively. I was encouraged. Seeing repentance in their little hearts is a blessing that I don't always see, unfortunately. They're all strong-willed, my kids. Discipline invites them to defy, seriously. Dr. Dobson wrote the new and improved version of The Strong-Willed Child with my children in mind. 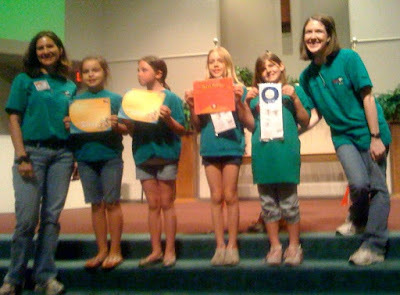 The latest round of back-punishment happened after our AWANAs end of the year ceremony. I was incredibly proud of them. They each learned over 150 verses this year. 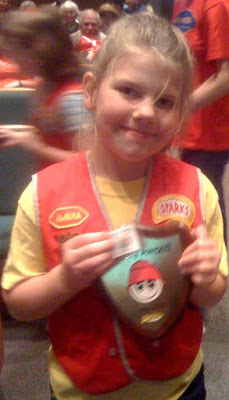 Alyssa got her Sparky award to signify three years and three books completed, quite a lot of verses memorized! Memorizing an entire book of verses was challenging with our schedule this year but they all three did it! Julia finished her first Truth and Training book with Bible studies and memorization activities. Even Hunter completed his book this year even though he can't read all the verses yet, he can say them! I have been begging the Lord to let His Word, living and active with the power to change lives, sink deep into their souls, motivating them to turn towards the Lord. After, said punishments, we were sitting around the dinner table. Alyssa asked me what I would wish for if I had one wish. I told her that was easy. I wished that my children and my whole family would choose to love God with their whole hearts and serve Him for the rest of their lives. Alyssa looked me in the eye and said, "I think your wish is coming true." She told me that she loved God so much her heart was full. She had been telling me for days how she was trying harder than ever before to do the right things and be responsible. But to hear her confess a whole-hearted seven-year-old love for her Savior made my heart leap for joy. Lord, may the seeds I've planted, watered and cared for so gently grow deep roots as they look toward the Son. Amen.